He was inspired by TV: “As a child I would see things on television and dream. I wondered what it was like, being in that two-dimensional world behind the screen. . . . When my parents were at work, and I was home from school, it was my best friend, TV, who taught me about another world. A world where you could be whatever you wanted to be . . .
“TV can tell you a lot about yourself. . . . As I grew older and went to school I met friends and cherished having them, as I wasn’t allowed to play when my parents weren’t home. So school was more about a place to talk and meet people. 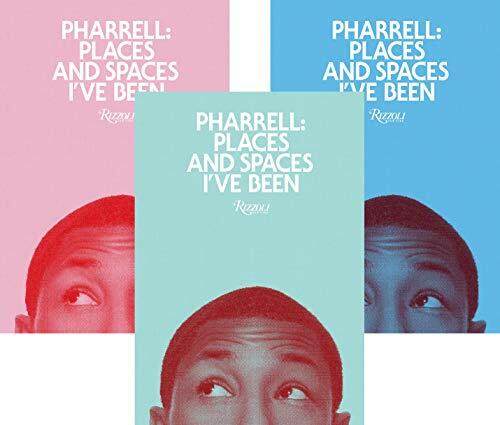 You know, a place to discuss how much we loved our favorite TV shows and music,” writes Pharrell Williams introducing Pharrell: Places and Spaces I’ve Been. His book is an experimental and multimodal meditation on contemporary cultural context and its implications. The presentation encompasses commentaries and visual images, conversations and interviews with an eclectic A-list cast, including Anna Wintour, Louis Vuitton, Madonna, Marc Jacobs, and more. A number of artists with whom he has collaborated in his artistic polymath career contribute to this book. His work manifests the vertical integration, culturally and commercially, and merging of art forms spanning music; fashion: clothes, jewelry, sunglasses; sculpture; toys; bicycles; furniture; retail stores—all pursued in varied contexts, relationships, and places. “Uh, rap songs, rock songs, pap songs, R&B songs, maybe even country songs,” he responds. “You name it, you can do it, huh?” the celebrated astronaut wonders. “Yes sir,” Mr. Williams replies. “Yeah, absolutely. And I think you have to look at the rhythms of life . . . not looking at it is very music industry. We’re the only industry that, just thinks we can avoid that, because for everyone in the music business, the biggest saying is, ‘Oh, it’s just about the song’. And yeah, that is true, but when I throw a song out into a big hole in the universe . . . I mean, the Internet didn’t exist before. It does now. . . . We have to pay attention to it . . . There is something out there we have to account for. It’s like shooting archery. You account for the wind. You shoot over to the left a little bit. Every industry, everyone accounts for these . . .” Jay-Z proclaims. Applying appreciation for the “various forces,” creativity, and celebrity, Mr. Williams has crafted a one-person artistic conglomerate career. In this highly stylized, personalized yet somewhat impersonal production, he depicts and describes the places he has seen in connecting the song to the music playlist to the fashion showroom to the Madison Avenue retail store. The mood and style range from raw to refined, grunge to glamour, silly to elegant, grit to glitz, cartoonish to formal, conceptual to concrete. There are numerous pictures of Pharrell Williams, a number featuring beautiful women including Catherine Deneuve. Other pictures feature his products and designs. Some of these designs are over-the-top, such as Warhol-style three-dimensional renditions of everyday products. The story of Mr. Williams’ places is presented in a style that is fully congruent with his own persona as the lavishly illustrated, high production value presentation mirrors the fashion forward style of its creator, combining color, images, and text—some of which, unfortunately, is barely readable in a near four point font. In Mr. Williams’ telling, his places and spaces convey a multicultural, trans-societal bridge between basic and sophisticated, idea and tangible, traditional and new, street and elegant interior. Collecting in one place the multifaceted aspects of Mr. Williams’s art, this volume will appeal to those fanatic fans who may follow one or more aspects of his prolific, diverse body of artistic creation. Those readers not already into planet Pharrell Williams may benefit from the experience of a heretofore unfamiliar cultural context that may enlighten their comprehension of the crossover from very different yet ultimately interconnected places.